No, I’m not going to abuse you by discussing southern gospel quartet singing. 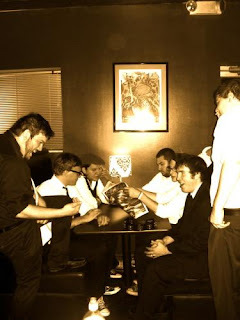 Ravenhill uses a combination of southern (read “black”) gospel music of the ’40’s and ’50’s with soul and indie rock. Please don’t take offense with the term “black” gospel, this term is still in common usage by the artists themselves. Ravenhill began in southern Illinois in November 2009. Originator of the band, Joshua Clifton, has described the roots of Ravenhill music as growing from the influences of punk, gospel, jazz, blues, grunge, indie, hard-core, soul, and classic rock. This eclectic mix of genres has created a rich and diverse musical style. Hearing the single “Blood On The Church Floor” drew me into Ravenhill’s music. Both a soulful, heartfelt and dramatic song. “BOTCF” epitomizes the band’s sound. The song describes martyrdom of a Christ follower. Martyrdom is when people are being persecuted for their beliefs and are usually put to death because they won’t renounce their beliefs. A rare topic for a modern Christian song, but one that should be discussed. Several versions, both full and acoustic have been released by the band. The greatest version being the full band version with Josh Clifton’s great vocals. Don’t be frightened of the 7:09 length, it is well worth a listen. Ravenhill has to be heard to be appreciated. Click for a free download of the EP Ladies and Gentlemen, I Present to You…. One Response to "Southern gospel?"